A proper garage door with a sturdy and reliable opener is necessary for car owners, as this can assure the security and safety of their vehicles. Remote control operated garage gate openers have been a popular choice for car owners for decades, as they make it easy to open the door by making use of radio frequencies. However, you may need help with installation or repair of your opener, and that's where we come in. 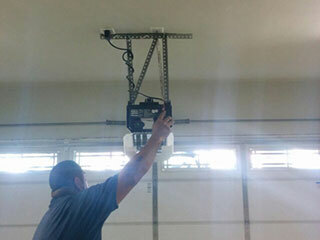 If you notice that your automatic garage operator doesn't work anymore, it's time to call us to check whether the problem is caused by a failure of the device or improper installation. We cover all types of automatic gate openers and check everything from the transmitter and the signal to signs of rust or other issues that may be obstructing the track. We also provide comprehensive services for remotes, so if you notice any failure in opening or closing your door with the use of such a device, we are the ones to call. Our experienced team members will diagnose the problem quickly and will provide you with the necessary repairs so that you can operate the door again in no time. If you are looking to have a new garage door opener installed, get in touch with us and we will provide you with the best options for your particular type of door in accordance with your budget. Multiple kinds of openers are available, so you can always go for the best. We cover all well-known manufacturers and we take pride in offering our customers only superior products and craftsmanship. Call Garage Door Repair Newcastle today for a dependable service from your established local team!